One of the hot spots to place AdSense ads on a blogger is between post title and content. If we place an ad unit below blog post title, it can attract maximum possible attention from visitors and thus have maximum Click Through Rate (CTR). Google has released an AdSense HeatMap to help users to understand the best placement locations on a web page. According to Google AdSense HeatMap, advertisement shown just below the post title and above content has maximum revenue potential. Now the big question, how to display advertisement unit just below blog post title on a Blogspot blog? This tutorial helps you to answer this question. To learn how to convert script in to escape characters, visit the link below. If you are using blogger classic template for your blog, follow the steps provided here. 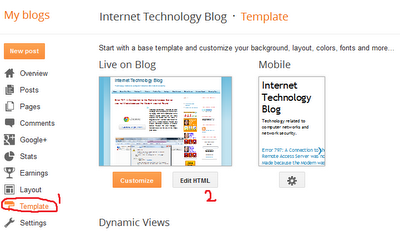 In the classic template, a little bit different to edit and add AdSense code compared to current blogger templates. Place the parsed AdSense code between the > symbol after P and " < " symbol before data. This tutorial explained the steps to show AdSense advertisement unit between Blogspot page title and content. However, after the recent Google algorithm updates, having too much ads unit on above the fold can attract penalties. Panda is known to target websites having too many ads, especially on the above fold. So my recommendation is to place a small ad unit below the title to avoid Google Panda penalty. After all, it is not the number of ads but the CPC matters most in net revenue. To read best practices in placing ad units on a webpage is explained in Google answers. To read that guide, visit the link below. It was certainly interesting for me to read that article. Thanks for it. I like such topics and anything that is connected to them. I definitely want to read more on that blog soon. It was very interesting for me to read that article. Thanks for it. I like such themes and everything that is connected to this matter. I would like to read a bit more on that blog soon. It is nice to see your support. It was certainly interesting for me to read that blog. Thanks for it. I like such themes and everything connected to them. I definitely want to read more soon. Really useful ! post more like this . Nice blog you got here. I'd like to read something more about this theme. Thnx for posting this information. It was certainly interesting for me to read that post. Thanx for it. I like such topics and anything connected to them. I definitely want to read a bit more soon. excited to find out way more of your content articles, stunning day! yah me too...i cannot find that html code... any help is much appreciated... thanks guys! Please use the Search feature of your browser to find the specific tag. [CTRL] + [F] will do it. you certainly provide some of the best ideas on how to improve a site run on Blogger. i blog at http://pesamfukoni.blogspot.com/ and your content has helped improve my sites layout. Thank you.